On May 25, 2017, Atlanta Area School for the Deaf in Clarkston announced the appointment of a new superintendent: John Serrano, Director of Academic Affairs at Texas School for the Deaf. He is the first Deaf "super" in AASD's 45-year history. AASD, located in an eastern suburb of Atlanta, is the region's only day school for Deaf students. Around 190 are enrolled. The school uses a Bilingual ASL/English approach, and all staff members are required to be fluent in ASL and English. 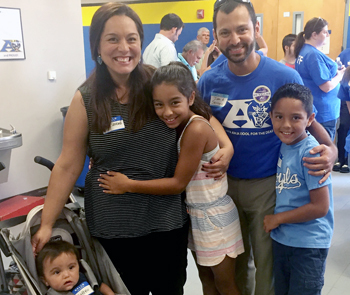 When Serrano's parents realized that he was deaf, they "immersed themselves in sign language." He graduated from American School for the Deaf. As he told us, "I had a wonderful childhood and ASD became my second home/family. While my family gave me access to communication and language, ASD gave me access to the world of opportunities and possibilities." American School for the Deaf, where he participated in extracurricular activities such as yearbook and Jr. NAD. In fact, he met his wife, Melly, at a regional Jr. NAD conference in North Carolina. At Gallaudet, he earned his Bachelor's in Elementary Education and Master's in Deaf Education. "Gallaudet taught me to think globally and maximize my leadership and networking skills." At TSD, he worked for 13 years "in various capacities . . . [including] elementary teacher, ECE/Elementary Summer Programs coordinator, HS principal," and finally, Director of Academic Affairs. Priorities include "early intervention and family engagement." He recognizes the importance of parental involvement as "one of the key indicators of student success." Other priorities are striving for academic excellence and maximum achievement for all students, and "cultivating and maintaining partnerships with families, neighboring schools, state department of education stakeholders, agencies, organizations, and any programs that may impact DHH children." In his spare time, he enjoys running and spending time with his family. He and Melly have three sports-loving children. "We enjoy going to their games and being their number-1 fans." He's still a UConn basketball fan, rooting for the Huskies. "Even though I have not lived in Connecticut since my high-school days, there's still some Connecticut blood in me." Any questions, comments, ideas, or concerns you’d like to share? Contact us at editor@deafpeople.com. Copyright © 2007 - 2018 MSM Productions Ltd. All Rights Reserved.